Parents and Grandparents: Baby Proof Your Home! It is recommended that the majority of your childproofing be done at one time. This insures that it is completed before a new capability results in a preventable injury. 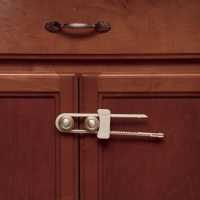 All lower drawers and cabinets in the kitchen and bathrooms should be latched before he ever learns he can open them. Accessible electrical outlets (both dormant and in-use) protected, vertical cords raised, pool fence installed, stairway gates in place, sharp corners protected, etc. Other items can be added as the need becomes apparent; door alarms, appliance latches, medicine cabinet latches, door knob covers, deadbolt locks, etc. Get down on your child’s level (that’s hands, knees, roll over on your back to get under furniture) and look up. Look around each room carefully as if seeing it for the first time. Crawl around and try to stick your head behind furniture, reach under furniture and feel around to see what is there (sharp springs or staples sticking out, plastic tags, etc.). Get under tables and look up; what would your child’s head hit if he stood up (sharp corners, manufacturer’s labels attached with staples sticking out, glass in the center of an end stand or coffee table).